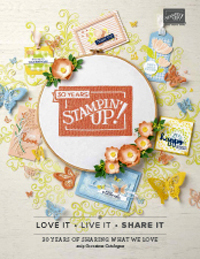 Every now and again I will be giving away written instructions for a Stampin Up! 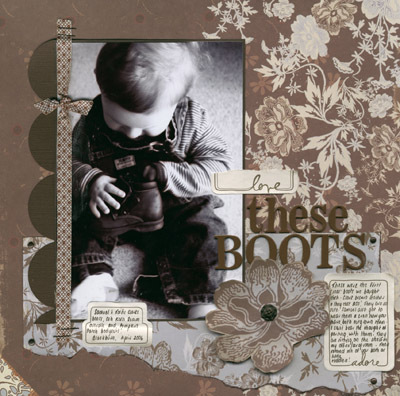 12x12 layout for you to download and copy for your personal use - sort of like my own inspiration sheets with photo sizes, measurements for cutting and placement etc. If you a demonstrator, I am happy for you to also use this with your customers, provided you only direct customers to my blog and do not attach it to any emails. You can download my first layout 'recipe' here (it's a PDF file) Download su_layout_playing_tourist_with_kate.pdf If you have any questions about using these, please email me. I have had a really really sore shoulder for months now. I have had physio with little success (he was treating my neck thinking it came from there) and it was really getting me down. It had been particularly bad the last few days to the point where it was stopping me from sleeping well. So I tried an Osteopath today and I have fresh hope! She diagnosed it as tendinitis of the shoulder and spent an hour with me doing all sorts of stuff including acupuncture and I feel so good I have fresh hope that it will get better. She was so good. The other great thing that happened today was seeing how happy Sam is at his one day at Childcare. He has settled in really well and seems very happy there. He even clapped and shouted 'yeahhhhhh' when we pulled up this morning. It's so much more relaxing having a me day when you know your children are happy. 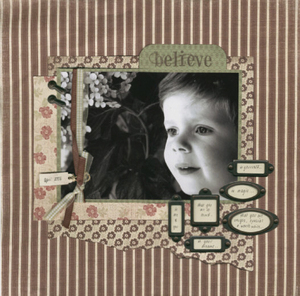 I am starting a new album called 'baby things' - I just want to do some layouts to remember all the baby stuff we have had in the house while the boys were little. We are getting rid of stuff now, so I want the memories recorded while I can. Just everyday stuff like favourite toys, furniture etc. This layout is about the first pair of boots I bought Josh (that were passed onto Sam who has them in this pic). I bought these papers on Sunday at the Scrapanalia crop. I had never heard of Websters Pages before but I really love these papers. Speaking of babies I am about to become a great Aunty for the first time. My sister Kate's son Daniel and his partner Jaime's baby is due to arrive any day now. Too exciting. Night lovelies, have a happy Thursday. Hasn't it been lovely? We had almost forgotten what it was like to sit listening to the rain. I have a colourbond garage roof outside my office/scraproom window which makes for lovely sounds when it's raining. We had over 30mm in Lilydale on Wednesday and Thursday, with more since then. I can almost hear the garden sighing with relief. The boys had their first sleep over at Nan's last night - well not technically a sleep over as I also landed there about midnight after a day out scrapping with friends. Had such a great time. Caught up with friends I hadn't seen in ages and spent as much time just catching up on everyones lives as I did scrapping. I am feeling great about my scrapbooking again now - I feel like I have moved back to the real reasons I scrap for, to tell my story and record the memories, with the pretty pages or use of the latest must have products not so important, or just an incidental outcome. I find it so relaxing and therapeutic to scrap like that. I had forgotten what that felt like. I did this page for Josh. Each of the label holders contains something I hope that he believes. There is also some more journalling under the photo. I took this photo when we were in Perth last April - those gorgeous hydrangeas you see in the back are on my Mum's front verandah. 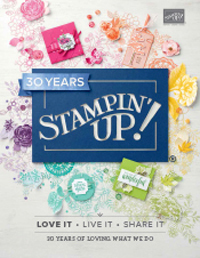 All of these products including the papers, label holders and ribbons are Stampin' Up. I love the new Typeset Lower Alphabet Stamps. The font is basic and so versatile and it's also a great size. 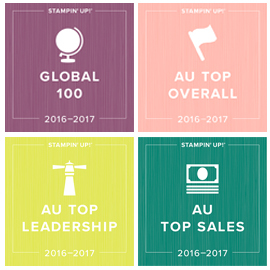 I can't believe how easy it is to stamp titles with the Stampamajig. That was probably the main reason I didn't stamp titles on layouts before, because I am a bit of a neat freak and was scared it would mess up my page. It's so easy now. 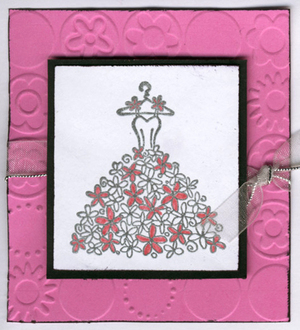 I also made this quick and easy mini card out of the Blooming with Happiness hostess set. This is such a popular set and so easy to get by hosting a small get together to make some things with friends. 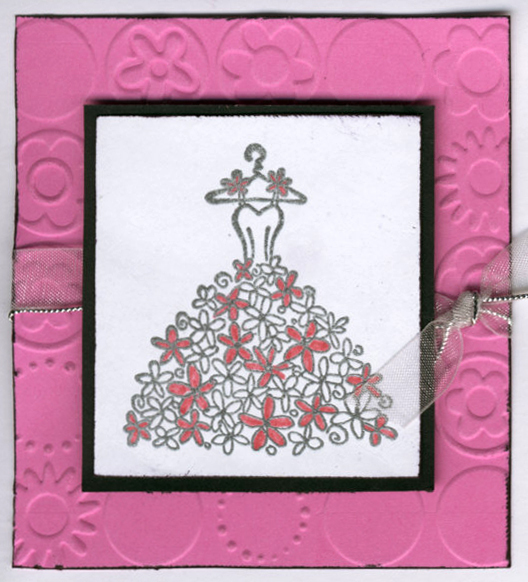 I have embossed the image using silver embossing powder and coloured some of the flowers using the rose regal marker. Simple, quick and I think cute. Time to get these boys into their bath and ready for an early night. I hope you all have a happy week and that we get lots more rain! my firstborn is 5. It seems like yesterday. I make sure I document at least one layout each year for both of my boys just noting down the 'stuff' that makes them who they are right now - things that will tell the sort of kid they were growing up. Journalling is so important. I can't stress it enough. Write stuff down, on every page. Real stuff like what you do, how you feel, everyday stuff. 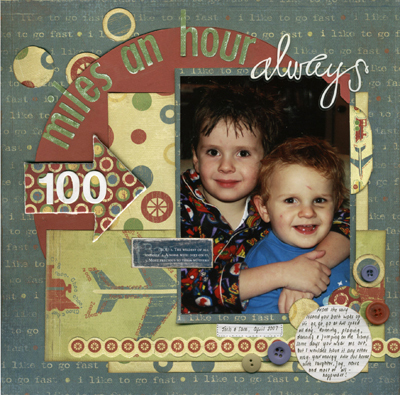 That's the heart and soul of scrapbooking for me. I see my albums as a 'book' with lots of pictures and patterned papers. 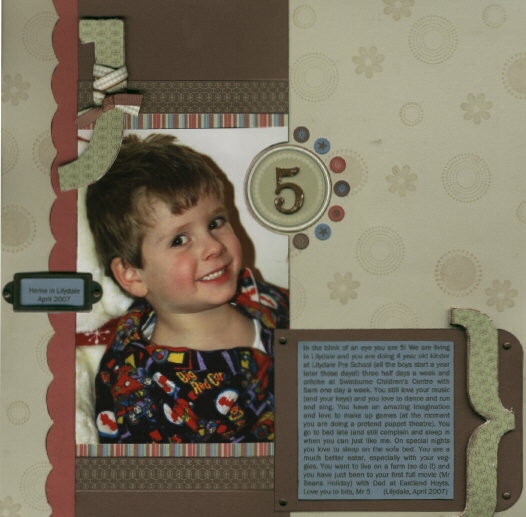 I made this page using one of the Stampin' Up! Simply Scrapping Kits (At Home). I love the rich colours in this kit - Chocolate Chip, Cranberry Crisp, Buckaroo Blue and lots of really useful cardstock stickers. 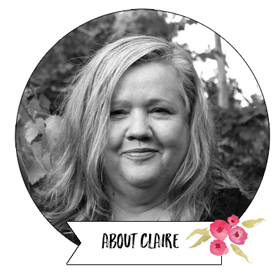 I also used the Stampin Up chipboard for the first time and OMG the quality is amazing. It;s so thick and strong and a perfect size for 12 x 12 layouts, and those brackets come with the alphabet set (so do numbers!). I have also used the Seeing Spots stamp set and Versamark Ink to create a subtle background pattern. This is something I will be doing lots more as I love the effect. It's raining here in Melbourne. That slow steady drenching rain that we really need. It's lovely. Night lovelies. Off to make more stuff with my Simply Scrapping kit. Paul has an RDO tomorrow so I get to sleep in (yeah). Love this picture of my boys I snapped last week. It shows the closeness between them and I love how it's just an everyday moment of them in their pyjamas! This layout is about how they are on the go from the second they wake to the second they go to sleep. Where do boys get their energy?